A lot of people would answer Nikon when asked what kind of camera they most like to use when taking professional photographs. That’s because the Nikon brand has managed to establish itself as one of the leading creators and developers of high-performance cameras, and with good reason. Nikon’s dedication to provide people with many camera options that can satisfy their highest expectations shows in the number of cameras they have on the market. One such camera is the Nikon D3300, which we’re going to talk about today. In our Nikon D3300 review, we’re going to touch upon its main features, what makes it shine, and what could have been made better. Naturally, the first thing we should discuss when it comes to a Nikon D3300 review is the way this camera performs. In this respect, the Nikon D3300 doesn’t disappoint, especially if we were to compare it with its predecessor, the Nikon D3200, or with other competitors. If you’re wondering how long it will take for you to power it on, focus on a particular subject and then shoot, the answer is about half a second, which is definitely impressive. Of course, the amount of time you’ll have to wait also depends on whether or not you’re shooting with the flash, whether it’s dark outside or not, and so on. When it comes to Live View, this takes much more to focus and shoot, which can be regarded as an obstacle by some people. Still, there are other things that make up for it, such as the fact that if you use your Nikon D3300 with a 95MB/sec SD card, you will get a 5.1fps burst, which is indeed amazing. We should also mention that its LCD is the same as in the case of older Nikon models, but this is a good thing, since it’s visible even when the sun shines bright, and it also has a perfect size. Next, let’s focus our Nikon D3300 review on some of its most impressive features. First of all, whenever you take a picture, you can choose between the Easy Operation and Advanced Mode options. The Easy Operation one is similar to Auto and it provides you with a limited number of features that you can use. The Advanced Mode is more suitable for people who have more experience using this camera. This one suggests what settings would work best for the scenario you chose. Plus, it also allows you to edit those setting if you want to. Another impressive feature is the Fn button that you can use to control ISO sensitivity, image quality, Active D-Lighting menus, or white balance. The SD card is not in its usual place, having been moved to a more convenient one, namely the grip-side location. Nikon also implemented the interactive display in this model, and we’re loving it. You can now simply adjust the options by looking under the setting readout. The Nikon D3300 looks almost identical to its predecessor. However, there are a couple of improvements that we should mention. For instance, it feels lighter and it’s much easier to hold for longer periods of time, which can be a great plus if you’re a professional photographer who takes pictures on a daily basis. Right on top of the grip, you’ll notice the shutter button and the power switch, and three more buttons behind them. Those three buttons are a record one, an info display one, and an exposure compensation one. The back of the camera includes the Menu, Review, Zoom in, Zoom out, and “i” buttons. Finally, we should mention that the Nikon D3300 also comes with a collapsible kit lens that you have to pay an extra $50 to get. Even if this could be an interesting addition for some people, it’s absolutely not necessary to buy it if you just want to take high-quality pictures. You can do that just as well with the basic Nikon D3300 camera. Something that we wish we could see in this model is bracketing, both for flash exposure and simple exposure, but this is not an option that the D3300 has. The most important pro that we should mention in our Nikon D3300 review is the image quality, which is really impressive. If you want your images to be full of details, then this is a great camera for you. Then, another pro is the fact that the ISO performance is very good, and the dynamic range as well. This camera has a high pixel count and a really great Guide Mode that is easy to use. When it comes to JPEGs, the Nikon D3300 has a really nice buffer capacity. Finally, some other things that impressed us were the uncompressed HDMI output, the 5fps continuous shooting rate, and the 1080/60p video. While there aren’t many significant cons that we can identify when testing the Nikon D3300, especially if we keep in mind its price, competitors, and target audience, there are a few things that we should mention under this category too. For instance, there’s a lot of image noise that users are complaining about. Plus, there’s no built-in Nikon D3300 WiFi, no AE bracketing, and a slow contrast-detect in Live View. When the natural light is not strong, you might have to struggle a bit more with taking a high-quality photo, and if the flash overheats, it will shut down. The automatic video autofocus could also be better, but this is not something that particularly bothers us. 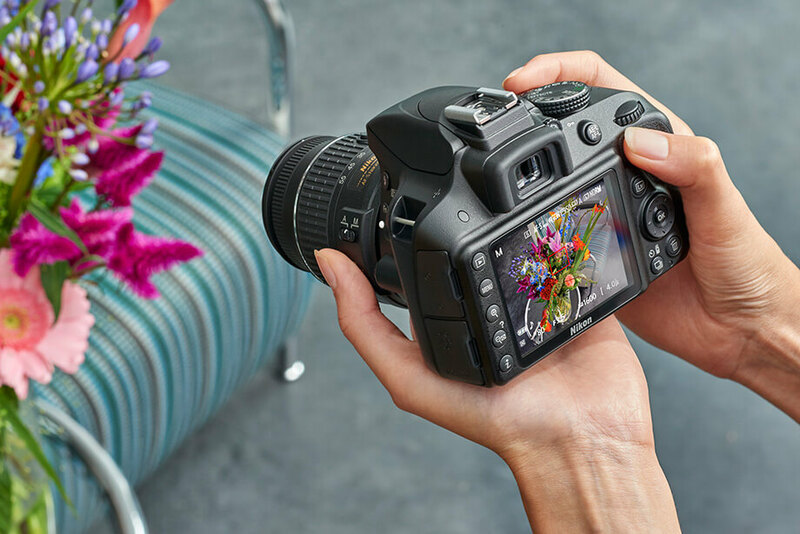 Finally, we would say that the Nikon D3300 is one of the finest DSLRs for beginners, because it comes with great features and it’s easy to use. Both compared to older Nikon models, and to several other competitors, the D3300 promises and delivers a lot of high-quality features for a really affordable price. We’re definitely most impressed by the quality of the Nikon D3300 photos, and we’re sure you’re going to be as well, once you test it out. We hope this Nikon D3300 review was useful to you. All in all, if you want to experiment with your first DSLR, we strongly recommend this one.